Bring modern elegance and natural beauty into your home with this planter pot. The white finish and the sleek, round design of this small flower / succulent planter help give your home the perfect touch of modern style, and the interior is just the right size to hold a potted plant and give your home a dash of fresh, natural greenery. Ready to brighten up your space? This charming planter is the perfect choice. Approximate Dimensions (in inches): 4.75 H X 6.75 Diameter. 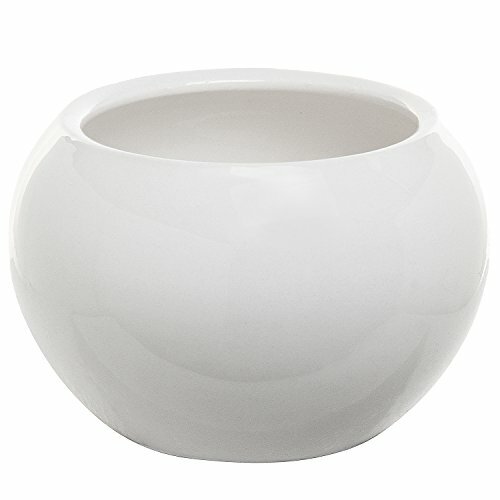 Adorable round succulent planter pot made of ceramic materials with a white glossy finish. Features a hole in the bottom that allows water to drain through the soil so your plant stays healthy.